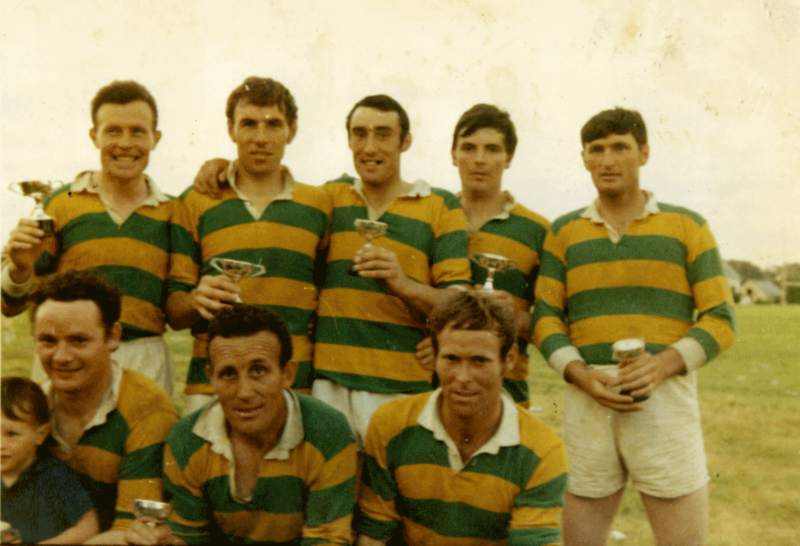 Players who have worn the Renvyle colours in 1972 are as follows; Paddy Fitzpatrick, Johnny Fitzpatrick, Michael Kane, Patrick Sammon, Johnny Sammon, M J Ruddy, Stephen Flaherty and Thomas Flaherty from Renvyle area, Charlie O’Malley, John O’Malley and Padraic Hynes from Recess, Joe Mannion, Joe Mortimer, Padraic Lydon and Liam Walsh from Letterfrack, Arthur Joyce and Tony Hamilton from Leenane, Petie Kane, Tuam and Chip Conneely, Clifden. Back Row (L to R) Johnny Fitzpatrick, Johnny Sammon, Joe Mannion, Joe Mortimer and Mikey Kane. Front Row (L to R) Chip Conneely, John Conneely (Mascot), Paddy Fitzpatrick and Charlie O Malley. Photo courtesy of Chip Conneely. It was a damp overcast day fifteen years ago, when the community turned out in large numbers to celebrate a real milestone that had been achieved through voluntary labour and subscriptions and would henceforth provide a much needed facility for the benefit of young and old. It was a remarkable feat at a time when money was very scarce and the area was decimated by emigration. Flags flew, a band played and marched, the Sam Maguire and National League Cups were on display and everybody wanted to get a glimpse of the members of that great Galway All-Ireland and National League winning team who turned up to play in a Tuam Stars versus a Connemara Selection friendly match. Household names such as Sean Purcell, Jack Mahon, Joe Young and Billy O’Neill lined out. Earlier Tullycross defeated St Cáillíns in a Mongan Cup match by a score of 0-6 to 0-2. F Conneely, captain of the St Caillins team scored the first point on the new pitch from a 21 yard free. Many great games have since been played in Tullycross in a variety of codes but for anyone now old enough to have been there on that day in 1957, the occasion will always be remembered. That evening over six hundred people walked and cycled to a Céilí in the CBS Hall in Letterfrack where the music was provided by the Assaroe Céilí Band from Ballyshannon in Co Donegal.